Welcome to the fourth issue of "The eBullet," an online newsletter of "The Andy Griffith Show" Rerun Watchers Club (TAGSRWC). Weaver's Dept. Store also has its own online newsletter, creatively called "The Weaver's Newsletter," that usually comes out in months that don't have either an "eBullet" or "Pocket" (January, April, June and September, and sometimes a bonus issue in November, including this year) and has more of an emphasis on news about new Mayberry products. Because of the different formatting requirements of subscribers' computers, we'll provide links to photographs rather than including photographs in the actual "eBullet," which necessarily must be a "text only" newsletter. Between issues of "The eBullet," keep up with the goings-on in Mayberry with the more-or-less daily "Who's Been Messin' Up The Bulletin Board?" Digest (WBMUTBB Digest). It's a free subscriber list made up entirely of comments, news flashes, and questions and answers from subscribers. You can sign up for that list, and the others mentioned above, by going to the TAGSRWC Web site and clicking the "Mailing Lists" link. We hope that, through "The eBullet," "The Pocket," the "Who's Been Messin' Up the Bulletin Board?" Digest, "Weaver's Newsletter," tagsrwc.com and our network of over 1,200 local chapters, all Mayberry fans can easily find desired information and ways to enhance their enjoyment of watching "The Andy Griffith Show." "A Beautiful Day," Ron Howard's latest film as director, is now in theaters nationwide and is receiving universal praise and several important award nominations. Jan. 6: James Best appears at the World of Wheels Auto Show at Bayside Exhibition Center in Boston, Mass. Jan. 19 and 20: Hollywood Collectors Show at the Beverly Garland Holiday Inn in North Hollywood, Calif. For more info, visit the event's Web site at http://www.hollywoodcollectorshow.com/. TAGS actress Margaret Kerry-Willcox is scheduled to appear. Other Mayberry stars may be added. Jan. 27: James Best appears at the World of Wheels Auto Show at the Baltimore Convention Center in Baltimore, Md. Feb. 3: James Best appears at the World of Wheels Auto Show at McCormick Place North in Chicago. Feb. 9: Betty Lynn and Howard Morris perform "Love Letters" at the Cross Creek Country Club in Mount Airy, N.C. The evening presentation is sponsored by the Surry Arts Council. It will be a dinner theater-style show with the $30 tickets limited to the seating capacity of approximately 300. For tickets or information, contact the Surry Arts Council at 1-800-286-6193 or write to P.O. Box 141, Mount Airy, N.C., 27030. For updates, visit http://www.surryarts.org/. Mar. 1 and 2: "Veterans of Comedy Wars V" hosted by Ronnie Schell at San Francisco State University. Funny folks already confirmed for the scholarship benefit concerts include Brett Butler and Kevin Meaney. George gives Jim Clark a "Judy, Judy, Judy" at the December 2001 get-together to celebrate George's birthday. Happy birthday George!! Mar. 16: George Lindsey will be inducted into the Alabama Motion Picture Hall of Fame in Tuscaloosa, Ala.
April 18-20: Fifth Annual George Lindsey TV and Film Festival at the University of North Alabama in Florence, Ala. Special guests TBA. May 4: George Lindsey performs at the Honeywell Center in Wabash, Ind. Again, check the Events Calendar at http://www.tagsrwc.com/ for more information and updates. Three Mayberry events with cast members are currently in the works for June and one for July. They should be confirmed soon. "I Already 10-4'd You" Nicholasville, Ky.
"The Governor's Coming HERE? Bless His Heart" Tullahoma, Tenn.
Malcolm Merriweather's Merrymakers of Merry Old England,Arkansas" England, Ark. New groups of folks are also talking about starting a chapter in Sarasota, Fla., and Ellsworth, Mich. If you are interested in starting a chapter of TAGSRWC, all you have to do is pick a name that has not already been chosen (check online for a list of chapter names that are already taken by going to http://tagsrwc.com and looking for link in the "Mayberry Information" area near the bottom of the main page) and submit a list of your founding members by postal mail to TAGSRWC's HQ at 9 Music Square South, PMB 146, Nashville TN 37203-3286. We'll verify your chapter name choice and send you an official Chapter Charter. Profits from the Mayberry for America T-shirt will continue to support general disaster relief in the new year until we sell out of our current inventory of the shirts. As of Jan.1, proceeds from the Special Items section will resume their pre-Sept. 11 purpose of helping TAGSRWC provide financial support to various Mayberry events planned for 2002-especially Mayberry Days. Thanks to everyone who has helped us support these charitable causes by making purchases at Weaver's Dept. Store and TAGSRWC. A portion of all sales at Weaver's goes toward charities and Mayberry events, but the Mayberry for America T-shirt and the Special Items section are set up to be entirely for the purpose of fund-raising. This recipe comes from page 261 of the memoirs/cookbook "In the Kitchen with Elinor Donahue," a collection of fantastic recipes by one of Mayberry's favorites. This is Elinor's mother's recipe for an all-American comfort-food classic. The book (available at Weaver's, of course) is filled with photos and memories (and recipes!) from throughout Elinor's life. Bernard Fox, Betty Lynn and other friends also share some of their favorite dishes in the book. In a large bowl, combine the ground meat, bread, onion, parsley and eggs. Squish it all together until well blended. Shape into a loaf and place it in a baking pan. Make an indentation with the side of your hand in the--loaf-either crisscross or diagonal--and put in the ketchup or 57 sauce. Bake at 350� for 1 hour and 30 minutes or until there is no pink in the juices. Do not put this in a loaf pan. You want it brown on all sides and free-standing. Though we had quite a few entries for this quiz, only four people got all of the answers correct. We picked the winner among the four by drawing a name from a hat. The winner is Mark Walker of Bossier City, La. Congratulations to Mark, who won his choice of any single item available in the November issue of "The Pocket," our printed newsletter. 5. Name a movie that has been rated 31/2 clovers by "The Mayberry Gazette." - "The House Without Windows"
BONUS: Name three people in Mayberry who have done impersonations of Cary Grant. - Goober, Gomer and the tricky part...Emmett Clark. Miss Crump was in the holiday spirit, so she put some slack in this issue's quiz. The prize is the winner's choice of any one item available in "The Pocket" (or online at Weaver's Dept. Store, except in the Collectibles section). The deadline for entries to be postmarked is Feb. 15, 2002. If there's a tie for the most correct answers, we will, as usual, draw a winner's name from a hat. The answers will be in the March issue of "The Pocket" and the May "eBullet." Good luck! 1. Name someone in Mayberry who is known to have received roller skates as a present. 2. Name a national legal document of which Barney says he has memorized a portion. 3. According to which Mayberrian, nobody leaves a wash basin the way Barney does? 4. To whom does Barney say, "All right, move over. I'm drivin'"? 5. Identify two specific places in North Carolina where one particular fish has been seen swimming. BONUS: Name eight comic strips or comic books or their characters that are mentioned in Mayberry. Word search puzzles have been a frequent and popular feature of the printed "Bullet" since its very early days. We won't take up space (or wrestle with formatting problems) in our online newsletter, but we do have an online interactive Mayberry Word Search puzzle that you can have fun with. Follow this link (http://iMayberry.com/tagsrwc/wbmutbb/wbmutbb/wordsearch/wordscrh.htm) if you'd like to try it out. We have more puzzles on our interactive crossword puzzle site. Just drop by to play either Gomer's (http://tagsrwc.com/interactive/crossword/GomersCrossword.html) or Emma's (http://tagsrwc.com/interactive/crossword/EmmasJawalking.html) puzzle. We also welcome your new puzzles so send 'em in! You can find Mr. Weaver's full lineup of favorite Mayberry items at http://iMayberry.com/tagsrwc/weavers/ but here are some of the newest items. Very few of these clocks were made and are no longer in production. It's quite an interesting collectible novelty...mainly because of its size. The entire clock measures only about 1 1/2 inches high (not counting the legs and antenna) and 2 inches wide. But it weighs a whopping 1/2 pound! It's just deadweight. The clock face is about the size of a wristwatch face and features the familiar shot of Andy and Opie eating pie as Aunt Bee looks on. The color of the TV set is a hip retro lime green. The suggested price for these collectible clocks is $30.00, but Ben Weaver is an old softy and has them for a great price while the limited supply lasts. Once the current stock is gone, there will be no more of these rare clocks. Drive in style with these new Mayberry license plates. They're full size and made with high-quality, durable plastic in two swell designs. They also make distinctive decorative accessories for your home or workplace. These ultra-stylish low-profile canvas caps come in navy and have an adjustable canvas strap to fit heads of many sizes. The "Andy Griffith Show" logo is beautifully embroidered in a grayish silver. These handsome navy blue sweatshirts have the TAGS logo embroidered with amazing detail. The quality and detail of the embroidery, combined with the very limited number of these sweatshirts that are being made, make the price a little higher than for normal sweatshirts. Sizes M, L, XL and 2XL. These lightweight, long-sleeved denim shirts are feature the TAGS logo. This is another embroidered item with a very limited run being manufactured. Sizes: M, L, XL and 2XL. These fine-mesh weave shirts come in a choice of white or navy and have the TAGS logo embroidered in gray. Very few are being made. Sizes: M, L, XL and 2XL. This is the same design as the All-Cast T-shirt, but is available while our supply lasts as a wintertime special as a sweatshirt. Sizes: M, L, XL and 2XL. This is the same design as the Barney Multi-Head T-shirt, but it is also available, while our supply lasts, as another wintertime special as a sweatshirt. Size: M, L, XL and 2XL. We have brand new Mayberry Mouse Pads in three fantastic designs: "Andy & Opie Fishing" (in full color), "Bug-eyed Barney" and "The Loaded Goat." (They also make nice coasters if you're a giant.) Check 'em out in the "What's New?" section at Weaver's. This DVD contains the following episodes: "Class Reunion," "Opie and the Spoiled Kid," "Aunt Bee's Medicine Man," "Andy's English Valet," Rafe Hollister Sings," "And Discovers America," "The Darlings Are Coming" and "Mountain Wedding". This DVD contains the following episodes: "High Noon in Mayberry," "The Great Filling Station Robbery," "The Rivals," "Dogs, Dogs, Dogs," "The Loaded Goat," "Barney's First Car," "A Wife for Andy" and "The Big House." Get both of the above DVD's together for the Special Price of $25.00. This brand new book (not to be confused with "Mayberry Memories: The Andy Griffith Show Scrapbook" by Beck and Clark, published last year) is a collection of Jewell's personal memories of growing up in Mount Airy during the same era as Andy Griffith. It's a very interesting look at Mount Airy and some of its connections, both old and new, to Mayberry. Lots of nostalgic and recent Mount Airy photos and drawings in 184 highly readable pages. The perfect companion for a visit to Mount Airy and almost like a visit there even if you can't visit the town yourself. David Browning has brought smiles and laughter to fans of The Andy Griffith Show for years through his portrayal of The Mayberry Deputy. His wholesome family humor brings Mayberry to life at all of his performances. This CD will allow fans that have seen him in person to relive the fun over and over again and allow those that have never had the pleasure of experiencing his performance in person to share in the Mayberry fun. David is not only a great performer but also, in the words of Gomer Pyle, "a wonderful human being." The VW Boys are a class act themselves. They have the talent to make you laugh along with them at the same time you're patting your feet to their great bluegrass music. The combination of music and comedy is something hard to do but these guys pull it off with style. The Mayberry Deputy and the VW Boys is a combination that you can't help but enjoy. It's 18 tracks of comedy and some music totaling about 40 minutes. Most of our Chapter News since the last "eBullet" is from chapters who have been holding holiday gatherings. Among those we've heard from are Opie chapter (Orlando, Fla.) and Barney chapter (Greensboro, N.C.). The Barney group usually has its best attendance of the year at its Christmas party. This year they gathered at the home of Mike and Kim Johnson, both of whom are talented artists. Their Mayberry Christmas tree is filled with mostly handcrafted ornaments representing moments from Mayberry. Everyone at the party brings and receives a Mayberry "gag" gift, which can not be a repeat of a gag gift from a previous year...with one exception: Old Sam the fish, who is wrapped up and secretly passed along (with much carping) as the booby prize each year. The Mayberry Undercover Agents (Danville, Va.) published another edition of their fine chapter newsletter, "The Mayberry Minute," in December and capped off another especially full year. The Undercover Agents were among the first out-of town chapters to report that Russell Hiatt's Floyd's City Barber Shop in Mount Airy now has a manicurist on duty. So it'll be no more having to use hedge clippers on their nails for Mayberry's menfolk. But we haven't heard yet whether there will be a discount for folks needing a manicure after enjoying a finger-licking good pork chop sandwich next door at the Snappy Lunch. Three members of "I Was a Pawn in the Hands of a Wily Woman" chapter (Plainview, Nebr.) visited Nashville and hooked with Andy chapter in December. Chapter members also plan to attend the "Love Letters" performance by Betty Lynn and Howard Morris in Mount Airy on Feb. 9. Mayberry chapter (Knoxville, Tenn.) has some big news coming in January, but it's tick-a-lock for now, so we'll just have to wait till next time to report on it. 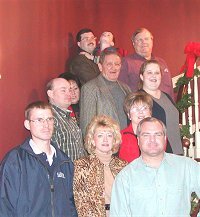 Several TAGSRWC members and chapters are involved in helping put on Mayberry events with TAGS stars in 2002. All are in the planning stages right now, but we should be able to have details about most of them in time for the February "eBullet. Andy Griffith has been spending time at home in North Carolina and staying out of the spotlight. Don Knotts is enjoying a relaxing bit of time off, but is planning to resume touring with Tim Conway in the two-man show for dates next summer, as well as doing a few other performances. Ron Howard's latest film as director, "A Beautiful Mind," is getting outstanding reviews and is receiving all sorts of award nominations, including Golden Globes. Look for father Rance Howard and wife Cheryl Howard in cameos. And brother Clint is starring in "The Clint Howard Variety Show" online at CountingDown.com. But be warned: It's an "edgy" show that bills itself as "the shortest, cheapest variety show in history." Folks from two states and Canada dropped in to wish George a happy birthday. 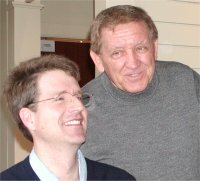 George Lindsey had several successful personal appearances and performances in December, including ones in Durham, N.C.; Stowe Vt.; and in South Dakota. An international contingent of friends from Alabama and Canada joined George in Nashville for a birthday celebration. George then traveled to San Francisco for Christmas with family members. In January, George will again be traveling to California to help the Travel Channel promote its "TV Road Trip" special that will premiere in April. (James Best also appears in the special.) In March, George will be inducted into the Alabama Motion Picture Hall of Fame and then in April he hosts the Fifth Annual George Lindsey TV and Film Festival at the University of North Alabama. TAGS associate producer (and personal manager of many TAGS actors and others, including Andy Griffith) Richard O. Linke and wife Bettina are looking forward to hosting a splendid wedding for daughter Bettina Marie in Hawaii in February. Jean Carson as Naomi the convict trying to get "Floyd" to fight. Photo by Bart Boatwright. Jean Carson is doing well in Palm Springs and looking forward to seeing old friends and meeting new ones at some of the Mayberry events in the works for 2002. TAGS music man Earle Hagen has put the finishing touches on his latest book, "Memoirs of a Famous Composer Nobody Ever Heard Of." The book should be available very soon. Ronnie Schell recently returned from an engagement at Harrah's in Las Vegas. He also performed for two sold-out Hospice fund-raisers in Florida in October. He's about to begin work on a film with Cindy Williams, Richard Moll and Pat Morita called The Biggest Fan. (Ronnie plays a deejay.) And Ronnie will be touring theaters in Florida with a comedy show in February. He is also set for a stage-show version of "Hollywood Squares" in Palm Springs for four days in April. A parting shot from George's birthday get-together. A good time was had by all. Barbara Perry (Floss and other characters) says that she is still doing extremely well after her hip surgery about this time last year. She's doing dance classes three times a week and is busy with her actors workshop. Amid periodic trips overseas (her daughter lives in Vienna), Barbara is performing and doing acting work whenever good opportunities pop up. Director Earl Bellamy, writer Harvey Bullock, Elinor Donahue, Sam Edwards, Sue Ane Langdon, LeRoy McNees, producer Aaron Ruben, George Spence and Barbara Stuart are among the other members of the TAGS cast and crew who have checked in since the last "eBullet." All are doing fine. By the way, Sue Ane Langdon is featured as Miss March in the "Swingin' Chicks from the '60s" calendar that's out for 2002. It includes photos (then and now) and brief bios of notable actresses, singers and models who were especially popular in the 1960s. It's an interesting calendar with wholesome, mostly cheesecake shots (that is, no especially fast lenses were used to photograph ribbons on ankles, etc.) of 13 popular stars. That's our news for this issue of "The eBullet." Look for your next issue in February. (For those who also subscribe to the online "Weaver's Newsletter," its next issue will be out in January. And for those who subscribe to the printed "Pocket", the next issue of that newsletter will be published in March. Mayberry says thanks and Happy New Year!